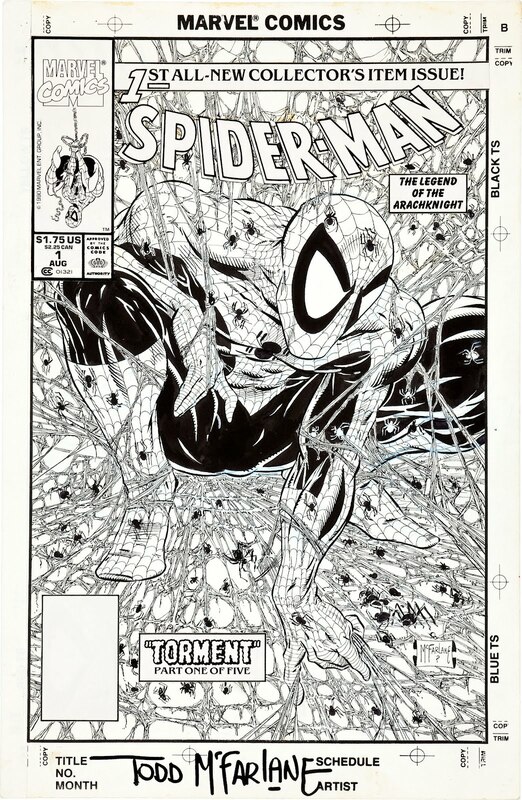 It seems that the original art for the cover of Todd McFarlane's Spider-Man #1 will be going up for auction soon. I've never seen a McFarlane original, so I was checking it out to see if I could learn a bit about his drawing process. Or, at least, his drawing process from twenty years ago. At the time, McFarlane was no stranger to drawing the web-slinger. He'd been drawing Amazing Spider-Man for about two years prior, so he had a pretty good handle on how he wanted to approach the character visually. So head on over to the Heritage Auction site for a good close-up of his art. The first thing I noticed is that there's very little corrective work in the inking. 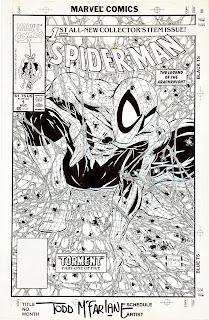 Despite a lot of lines going on in all sorts of different directions, McFarlane's original art is fairly clean. 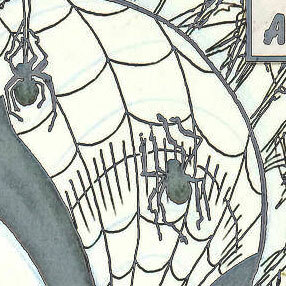 Looking a little more closely, you can see some of his blue line sketches underneath the inks. Here again, things are pretty clean for that stage. It looks like he had a few minor issues with the specific placement of the lines defining Spidey's left leg, but by and large, it looks like he had a clear image of what he wanted and basically just had to copy that to paper. There are some very light lines that arc over the mask. At first, I thought the couple I saw were indicative of possible placements of that highlight line that arcs across Spidey's forehead, but on closer inspection, they appear to be guidelines for the webbing. For the most part, the scalloped webbing joins with verticals at exactly the same points as the lightly drawn arcs. It's a fairly obvious way to ensure that Spider-Man's webbing is at least internally consistent, but it was never something I gave much thought to. The handful of times I've drawn the character, I just kind of eyeballed my way around his costume. I'd wager that's an approach a number of professional artists have used as well. But what McFarlane has done, by using these guides, is to provide a depth to the costume -- he can more easily figure out how the costume who wrap over the human form if he doesn't have to draw the scallops, but instead essentially provide a grid right on the character. This is why I love examining original art. Even though comic art is designed to be printed in a mass production process, checking out the original art gives some insight into a creator's process and ideas. Fascinating stuff! Great detective work, sir! I think I would've missed that on my own, but looking at it- I have to agree with your conclusion 100%!